There are currently 29 species in the Melanophryniscus Genus, commonly known as South American Red Belly Toads. While some of these are endangered and not found in the pet trade, others like the Bumble Bee Toad, Maldonada red belly toad, and klappenbach red-bellied toad are. And they make great pets, especially for beginners. Daily misting and feeding, replacing their water, and cleaning their enclosure once a week is all that’s required; roughly 15 – 20 minutes. These toads are easy to care for an becoming more and more common in captivity. They’re easy to care for and, to be frank, they look very appealing. Not only that but their bumpy skin and bright colors make them visually appealing. Some are black with pretty, bright yellow patches covering its entire body while others are green, black or brown. Their bellies and feet are red, which is why they’re referred to as “red-bellied toads”. So, if you’re looking for a great pet for beginners, you’ve come to the right place. This care sheet is filled with all the information you’ll need to take care of South American Red-bellied Toads. South American Red Belly Toads are native to Argentina, namely the northern regions; Bolivia, Paraguay, and Uruguay to name a few. They occur at elevations around 6,000 feet in grasslands, tropical and subtropical forests, freshwater marshes, moist savannas, and rocky outcrops. Breeding takes place after heavy rains in flooded areas. Their gelatinous eggs are attached to rocks, submerged stems and other vegetation in shallow streams and ponds. Under the right conditions, these toads reproduce at phenomenal rates. However, due to loss of habitat, some of the species in the Melanophryniscus Genus are endangered. 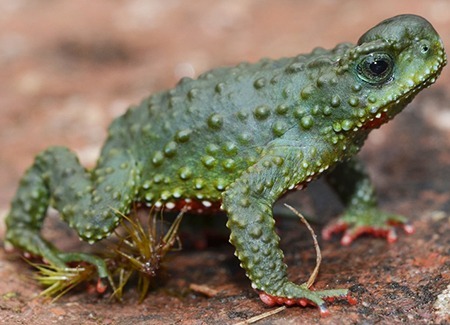 Maldonada Red Bellied Toads (Melanophryniscus moreirae) were on the IUCN Red List since 2000 as an endangered species. An update in 2004 changed their status to Near Threatened (NT) but needs an updated evaluation to determine their current state. They have small bumps covering their whole body with a black and brown coloration. Their underside, however, is where their name comes from. Spanning the length of the toad’s belly is a bright red color which covers their feet as well. The Bumble Bee Toad (Melanophryniscus stelzneri) is the most popular of the Red-belly species kept in captivity. Their rise in popularity is due to their explosive breeding habits and their unique coloration. In the wild, they inhabit Argentina, Buenos Aires and possibly Bolivia. 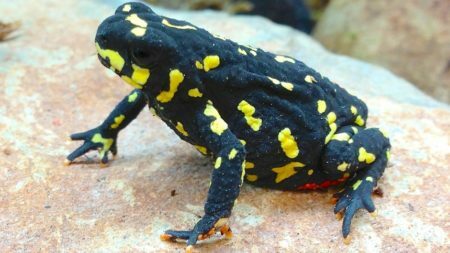 Bumblebee toads have no major threats as of now. They adapt well to agriculture, have a healthy population and they’re regularly caught and sold as pets. The Klappenbach Red-bellied toad (Melanophryniscus klappenbachi) hails from the Chaco region of Argentina, where their population is currently stable. This species lives in shrublands as well as the local agricultural farms. This species is very similar in appearance to that of the Bumble Bee Toad. It’s mostly black with bright yellow marking covering their entire bodies. In addition to that, they have a bright red belly (usually towards their hind-end) with red feet. 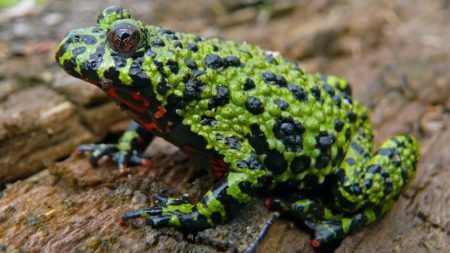 A bright green color with a yellow and orange belly is what makes this toad one the most appealing in the world. It’s bumpy skin and enlarged snout adds to its pleasing appearance as well. Their population is small and because of this, only small numbers of this species are found in the pet trade. Researchers know of only two subpopulations in protected areas where this it lives. The data is deficient, so their vulnerability has yet to be determined. On a good note, however, the Melanophryniscus genus is known for reproducing quickly; the cambaraensis stands a good chance of survival. The reason red-bellied toads are so highly suggested for beginners is due, in part, to the small start-up cost. Not only that, they require very little up-keep. Spending 15 – 20 minutes a week cleaning their enclosure, feeding them, and misting daily is all it takes to keep them happy and healthy. The size of their cage largely depends on the number of toads you’re keeping. 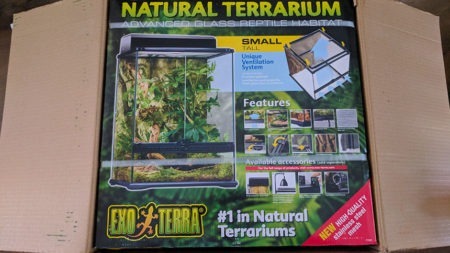 A large exo-terra faunarium is big enough for 1 – 2. After all, full-grown females are less than 1.5 inches in length and adult males are even smaller. A 10-gallon aquarium will house 3 – 6 fire-bellied toads. As for the type of enclosure, I recommend using something with ventilation. Any tank will work, just be sure to use a screen lid. If, however, you’re not concerned about the extra cost, a small exo terra terrarium (18″ x 18″ x18″) is a great option. These terrariums humidity while allowing airflow throughout the enclosure. For red-belly toads, hides are a must. Creating them is a simple task, one accomplished by providing decorations like cork bark flats, reptile hides, plants, and leaf litter. It helps your toad feel safe, which results in you seeing them more often! With nearby hiding places, your pet toads will feel more comfortable venturing around their habitat. A small, shallow water dish is recommended. Avoid using deep water dishes as red-bellied toads are not great swimmers. Check the water daily and clean their enclosure 1 – 2 times per week. South American Red-bellied toads do not require special lighting. Many people will argue the usefulness of a 5.0 or 2.0 UVB light bulb but I’ve yet to find any scientific research that supports this theory. Having said that, using a 5.0 UVB bulb is certainly acceptable if you need it for live plants. Room temperature is a great starting point for this species. In their native habitats, the temperature fluctuates considerably, so you have a wide range of temperatures to work with. 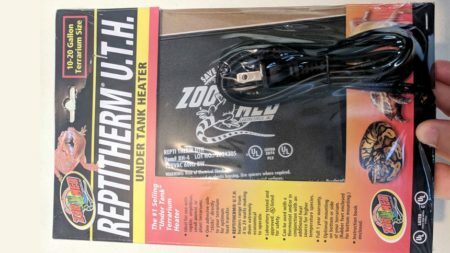 I recommend keeping their enclosure between 65 – 75 degrees Fahrenheit. If your power gets shut off for several hours or even days, your little red-bellied toad will be just fine so long as the temperature stays between 45 – 90 degrees Fahrenheit. A non-particulate substrate like coconut fiber, ABG mix, and sphagnum moss are preferred options. I recommend coconut fiber because it’s cheap and easy to use; it comes in compressed bricks or as ready-to-use look coconut fiber in bags. I also recommend providing leaf littler in additional to the substrate you choose. This is a common method used to create addition hiding places. It’s certainly not required, especially if the habitat has plenty of cork bark flats, plants and other decorations your toad can hide in. Red-bellied toads do ‘t require a large amount of water. In fact, they’re not great swimmers so I recommend using a shallow water dish. Make sure they can easily climb in and out of their water dish and change their water 1 to 2 times per week. It’s very important to use clean, quality water. Being an amphibian, these toads absorb water through their skin. 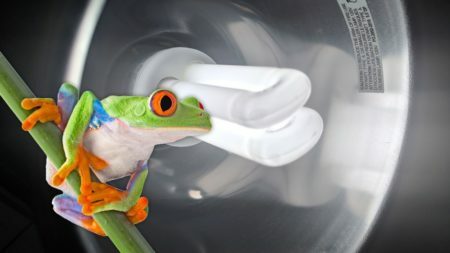 Chemicals like chlorine and chloramine are harmful to amphibians, and those chemicals, along with others, are sometimes found in tap-water. Distilled water is perfectly clean, being 100% water with zero chemicals, but it lacks the required minerals and balanced pH levels amphibians need. Read our safe water guide for more information. My suggestion is to use bottled water or tap-water treated with amphibian-safe water conditions like ReptiSafe. Much like their tolerance to temperatures, red-bellied toads survive in a wide range of humidity levels. Don’t let this be an excuse to not mist their cage though. I suggest misting their cage daily to keep the humidity between 50% – 60%. To keep track of the humidity, I suggest spending a few dollars on a digital hygrometer. If the humidity in their cage is too low or too high, it can lead to problems. 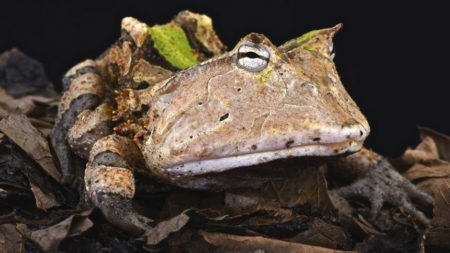 South American Red Bellied Toads cannot tolerate humidity levels over 70% for a sustained period of time. Ventilation is important, this is the reason a screen lid is recommended. Due to their small size, red belly toads cannot consume full-sized crickets. They do, however, feed on plenty of readily available food sources; things you find at your local pet store. Feed your red-bellied toad between 4 – 6 small crickets each day. The quantity should be adjusted depending on your toad, based on overall size. Basically, you need to feed them as much as they will eat in a single feeding. I suggest feeding them 4 small crickets, to begin with. If your toad eats all of them, give him or her 1 more cricket and so on. Remove leftover crickets after feeding. As for fruit flies, I recommend starting with 20 – 25 and adjusting from there. Before feeding, dust your toad’s food with supplements to ensure they’re getting the vitamins and minerals needed to stay healthy. I suggest using a calcium supplement daily while dusting with a multivitamin 2 – 3 times per week. This species is notorious for being difficult to breed in captivity. In the wild, however, it’s a completely different story. 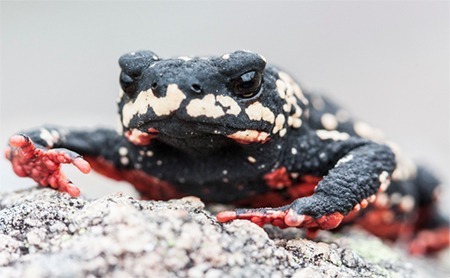 South American Red-bellied Toads have explosive breeding habits in their natural environment, allowing them to increase their population in a short period of time. In captivity, this simply is not the case. To have success breeding your toads, you need to mimic their natural environment. This is best accomplished in an enclosure with a rain chamber or perhaps a vivarium with a full or partial water bottom. Replicating a cool season, with little rainfall for 14 – 21 days, followed by a warm season, with lots of rainfall, are the conditions most likely to produce fertilized eggs. In short, you need more water than a small, shallow water dish and control over their cage’s temperature. Determining whether your toad is male or female is a tricky task at a young age. Once they’re fully matured, however, it becomes obvious. 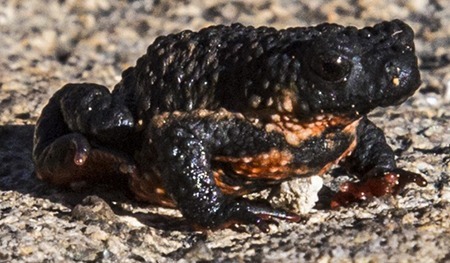 Male red-bellied toads are small and slender. The females are bigger in comparison, up to twice the size of the males. Females grow up to 1.5 inches while the average male is 1 inches or smaller. 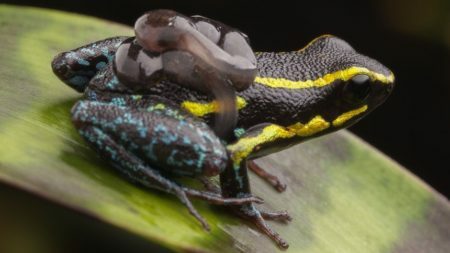 While the occasional surprise of tadpoles in a toad’s enclosure has been known to happen, it’s not likely. In order to get them to breed, your best chance is to mimic their natural environment during the breeding season. In the wild, they breed during the rainy season when temperatures are warmer. Replicating their natural environment takes time and careful attention. Start by decreasing their cage temperature to 60 degrees Fahrenheit and completely stop misting. So long as they have access to water in their enclosure, they will be fine. Keep this up for 2 – 3 weeks. Once 2 – 3 weeks have passed, the next step is to mimic the beginning stages of the rainy season. This is best accomplished in a vivarium with misting systems or rain chamber; the humidity and water levels should rise slightly. The temperature should go back to normal or slightly above; somewhere between 70 – 75 degrees ° F. Same thing with the humidity, increase it back to normal or slightly above; between 60 – 65%. Should you have success, your toads will assume the amplexus position, where the male grasps the female around the torso. Her eggs are released while the male fertilized them outside the body. The fertilized eggs will hatch in 3 – 5 days. After the eggs hatch, the tadpoles will rest at the bottom of the water for 1 – 2 days. During this time they will absorb the rest of the yolk from the original egg sac. Once they begin moving, it’s time to start feeding them. A 15mm petri dish filled with Repashy savory stew should be added to the tadpole’s water each day. Meanwhile, partial water changes are needed to maintain a healthy environment. Within 1.5 – 2 months, your tadpoles will grow front and back legs and begin walking on land near the water. Continue feeding them the same tadpole food until they’re big enough to eat fruit flies. Since toads are easily stressed, it’s best to limit the time spent handling them. Cleaning their enclosure takes about 15 – 20 minutes, once or twice a week. Placing your red-belly toad into a container is a great option to get them out of your way while you clean. This is perfectly acceptable and should not cause too much stress for your lovely pet.